I have downloaded a DEM from the NASA server with "SRTM Downloader". I want to find the watershed area, so I run the "r.watershed" function form the Processing Toolbox. I saved the DEM on the Desktop, but it did not help. What do I need to do in order to run this process properly? Loading resulting layers The following layers were not correctly generated. 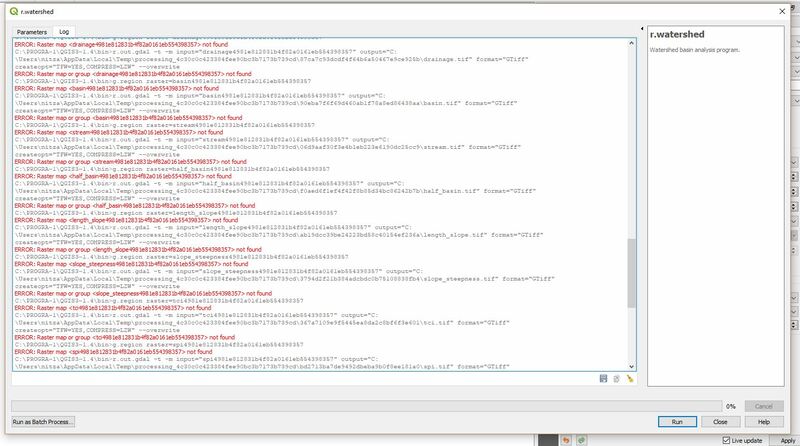 You can check the 'Log Messages Panel' in QGIS main window to find more information about the execution of the algorithm. I think that the problem is the missing threshold parameter. In the GUI window it appears as "optional" since there are some simple uses for r.watershed that do not require a threshold. But for any normal use of this module you must provide the threshold. It is worth to notice that in the QGIS GUI, the parameter is not mentioned at all by its original name threshold of the GRASS command, but it is the value of the box under the text Minimum size of exterior watershed basin [optional]. "Sorry, if any of the following options are set: basin, stream, half_basin, length_slope, or slope_steepness you MUST provide a value for the basin threshold parameter." Not the answer you're looking for? 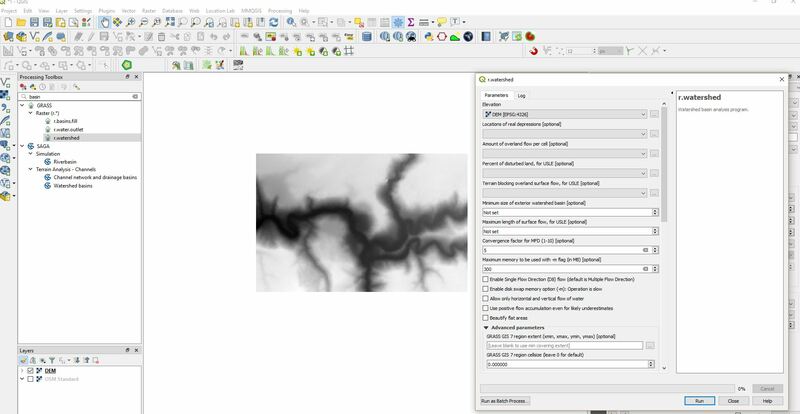 Browse other questions tagged qgis grass qgis-processing watershed or ask your own question.